Amur Minerals is an exploration and development company focused on base metal projects in Russia’s Far East. The company’s principal asset is the Kun-Manie nickel sulphide deposit in the Amur Oblast, comprising over a million tonnes of contained nickel. On 26 February, Amur Minerals announced the long-awaited results of its updated pre-feasibility study (PFS) into its Kun-Manie project in Russia’s Far East. In contrast to previous studies, the PFS considered just two options, namely a toll smelt option and a low-grade matte option, and dispensed with the high-grade matte and refinery options. Both considered a c 6Mtpa mine operating for 15 years. For the toll smelt option, the PFS calculated an unfinanced NPV10 of US$614.5m and an IRR of 29.3% at a nickel price of US$8.00/lb (US$17,640/t). For the low-grade matte option, it calculated an unfinanced NPV10 of US$987.4m and an IRR of 34.7%. Based on a combination of the NPVs published by Amur for the toll smelt and low-grade matte development options at Kun-Manie and the EV/NPV multiples calculated in our report Gold stars and Black holes – Analysing the discount: From resource to sanction, published in January 2019, we calculate an immediate valuation for Amur of US$60.8m (or 8.7c/share) based on the toll smelt option, or US$97.8m (or 14.0c/share), based on the low-grade matte option (excluding net cash/debt). However, given the strong early stage correlation between EV/NPV ratios and project IRRs and the projects’ relatively high IRRs, these valuations could be as high as US$79.9m (or 11.4c/share) for the toll smelt option and US$157.0m (or 22.5c/share) for the low-grade matte option. In the meantime, Amur is commencing a Russian feasibility study (TEO), which it anticipates will be completed in CY20 and which it intends to finance via a strategic partner in order to minimise any additional dilution from further drawdown of its convertible loan facility (see page 18). Based on a long-term nickel price of US$7.17/lb (cf a spot price of US$5.88/lb at the time of writing), we calculate an 8c/share valuation based on the net present value of the (fully diluted) stream of dividends that results from the proposed toll smelting development of Kun-Manie in FY19 (using a 10% discount rate) and a 12c/share valuation from the low-grade matte option. These compare with valuations calculated in our April 2018 note of 15c and 27c, respectively, based on a 10% discount rate applied to forecast dividends (although these were calculated at a nickel price of US$7.50/lb and assumed equity dilution at a 4.4p share price). If our valuations, based on 2019’s PFS, were conducted at a nickel price of US$7.50/lb and a share price of 4.4p, then our valuations for the toll smelt and low-grade matte options would be 16c and 22c, respectively. Based on a combination of the NPVs published by Amur for the toll smelt and low-grade matte development options at Kun-Manie and the EV/NPV multiples calculated in our report Gold stars and Black holes – Analysing the discount: From resource to sanction , published in January 2019, we calculate an immediate valuation for Amur of US$60.8m (or 8.7c/share) based on the toll smelt option, or US$97.8m (or 14.0c/share), based on the low-grade matte option (excluding net cash/debt). However, given the strong early stage correlation between EV/NPV ratios and project IRRs and the projects’ relatively high IRRs, these valuations could be as high as US$79.9m (or 11.4c/share) for the toll smelt option and US$157.0m (or 22.5c/share) for the low-grade matte option. By contrast, we calculate an 8c/share valuation based on the net present value of the (fully diluted) stream of dividends that results from the proposed toll smelting development of Kun-Manie in FY19 (using a 10% discount rate) and a 12c/share valuation from the low-grade matte option. A 10% change in the base case nickel price results in a c 5–7c change in valuation for the toll smelt option, but a 2–4c change for the low-grade matte option (based on our discounted dividend valuations). By contrast, a 10% change in costs results in a 1–3c change in valuation for either development scenario (see page 18). Since entering into a US$10m convertible loan agreement in February 2018, we estimate that Amur has converted US$2.4m of an initial US$4m advance via the issue of 59.6m shares, leaving US$1.2m (net) of the initial advance outstanding. As of 22 March, Amur has renegotiated the convertible’s terms and drawn down an additional US$0.5m, such that US$5.5m remains undrawn. As at 30 June 2018, Amur had US$1.0m of net cash after US$2.5m of cash outflows (before financing) in H118. We estimate a further US$2.1m of cash outflows in H218, resulting in estimated US$1.1m of net debt as at 31 December 2018 (funded by the convertible loan – see page 18). Amur Minerals has a 100% interest in the Kun-Manie project in the north-east corner of the Amur Oblast in Russia’s Far East. The Kun-Manie project encompasses a 36.2km2 area within the 950km2 Kun-Manie exploration licence area and is located 700km north-east of the capital city of Blagoveshchensk on the Chinese border. 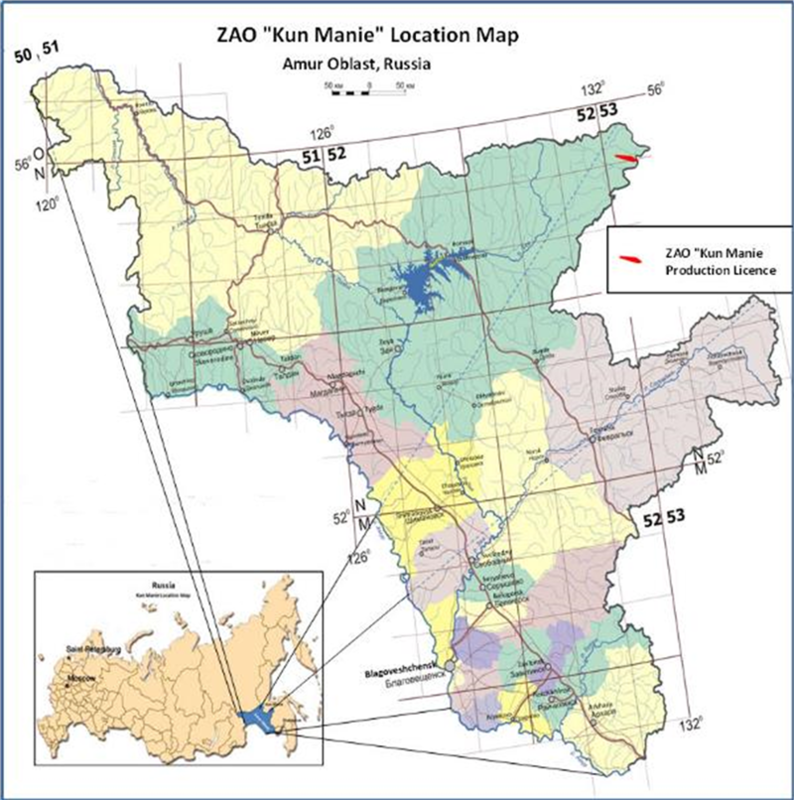 In April 2004 ZAO Kun-Manie, a wholly owned subsidiary of Amur, was granted an exploration licence to explore for nickel and related metals, including copper, cobalt, palladium and platinum, in the Kun-Manie licence area. Amur commenced seasonal field work (running from June to October) on the licence in 2004 and issued a JORC-compliant statement in 2007 covering three deposits located on the 40km-long Kurumkon trend, namely Maly Kurumkon, Vodorazdelny and Ikenskoe. In November 2007, consultants SRK completed a pre-feasibility study for Amur, concluding that a project designed to produce a nickel concentrate had a net present value of US$89m at a discount rate of 10% and nickel and copper prices of US$7.50/lb and US$1.50/lb, respectively. Since 2007, exploration and drilling has been conducted on an ongoing basis and an updated resource estimate was compiled in late 2013 (and subsequently upgraded in April 2015, March-April 2016, February 2017 and March 2018), which included two additional deposits on the trend: Kubuk and Gorny. In 2008, Kun-Manie was designated a Federally Strategic Project according to the 2008 amendment of Russia’s subsoil law, the practical relevance of which is that ‘strategic’ projects must complete exploration activities before a production licence can be granted. To this end, a new protocol established that this exploration phase had now been completed. In June 2014, Amurnedra (a sub-agency and regional representative of Rosnedra, the state licensing agency) completed its review of Amur’s exploration activities and subsequently issued a protocol confirming that the initial exploration phase of the Kun-Manie project had indeed been completed and that the company had met its obligations in the 950km2 licence area under the terms of its original exploration licence – a key precursor in the conversion of a Federally Strategic Project held as an exploration licence to that of a production licence. In particular, the protocol confirmed that Amur had completed sufficient and substantial work to identify a 36.2km2 area of economic interest, which supported the boundary limits for the mining application. In addition, it confirmed that the area located outside the area of mining interest had also been sufficiently explored, which allowed Amur to return 913.8km2 of unwanted territory to the Russian government. As the initial exploration phase of the project had, at that point, been completed, the way was paved to progress to the next phase of development under the Russian system, namely a detailed exploration and production assessment of the project, conducted under the terms of a new production licence (see Permitting section, below). Initially, Amur undertook an extensive soil geochemical survey covering two areas of its Kun-Manie lease, totalling 57.5km2. The 15km long and 2.5km wide Kurumkon Trend contains the deposits of Maly Kurumkon-Flangovy, Vodorazdelny, Ikenskoe-Sobolevesky and Kubuk, which are located within the limits of the licence and are the subject of Amur's mining licence (and the PFS). The locations of all these deposits (all within the area that is the subject of Amur’s 36km2 mining licence) are shown in Exhibit 3 below. By expanding its short-term exploration strategy while simultaneously pursuing its mining licence, Amur greatly improved its understanding of the geological controls on Kun-Manie’s mineralisation. The host rocks at Kun-Manie are early Archaean meta-gabbros, crystalline schists, gneisses and granite gneisses. A series of outcropping mafic and ultramafic sills dipping from near horizontal up to 60° to the northeast contain the sulphidic nickel, copper, cobalt and PGM mineralisation. The sills are tablular in shape and range from c 1m to more than 100m in thickness. The primary minerals of economic interest are nickel-bearing pyrrhotite and pentlandite and copper-bearing chalcopyrite, which occur in both disseminated and veinlet form, predominantly within the ultramafic sills and rarely in the mafic sills. The mineralised ultramafic sills are websterite by composition being pyroxenitic with near equal parts of orthopyroxene and clinopyroxene, including minor, locally variable amounts of olivine, plagioclase feldspar and amphibole. Source: Amur Minerals, Edison Investment Research. Note: Totals may not add up owing to rounding. The mineral resource update followed the exploration work that Amur conducted during the 2017 field season, which indicated possible linkage between the Ikenskoe and Kubuk deposits. This was later confirmed by 2018 drilling. However, the results of the 2018 field programme have not been included in the PFS results, notwithstanding the fact that the two deposits together (see Exhibit 3) constitute the largest single mineralised zone at Kun-Manie. As the deposits are all near surface, it may be expected that a high rate of conversion from mineral resource to mineable reserve is possible. In addition, a further 37.0Mt of inferred resource may also be upgraded to reserve status. To date, Amur’s PFS envisages that 89.4Mt, or 57.7%, of the total resource tonnage will be mined, comprising 71.5Mt from the measured and indicated categories (60.5%) and 17.9Mt from the inferred category (48.4%). Source: Edison Investment Research, Amur Minerals. Note: *At prevailing metal prices at the time of writing. Based on Edison’s estimated end-FY18 net cash position of US$2.2m, Amur’s enterprise value of US$25.5m equates to US$22.02 per total nickel resource tonne. In May 2015, Amur announced that Russian Prime Minister Dmitry Medvedev had approved the company’s detailed exploration and mine production licence for Kun-Manie until July 2035. This then enabled the Ministry of Natural Resources (MNR) and Rosnedra to issue the licence, subject to Amur paying RUB23.6m (c US$429,000 at the time of payment) within 30 days of the registration of the final document, which was duly done. The licence grants Amur’s wholly owned subsidiary ZAO Kun-Manie the rights to recover all value from the minerals defined to be present at Kun-Manie, including nickel, copper, cobalt, platinum, palladium, etc. Note that all drilled mineralisation lies within the limits of the production licence. In due course, additional work related to metallurgy and engineering will be compiled in a final, permanent Russian feasibility study (TEO) to be approved by the GKZ (the State Reserves Committee), including additional results for detailed exploration. annual activity reports must be submitted to Rosnedra and Amurnedra. If, during the life of the licence, exploration results further increase the size of the resource and/or reserve, the company can apply to have the production licence expanded and extended. Since 2007, exploration and drilling has been conducted on an ongoing basis and an updated resource estimate was compiled in late 2013 (and subsequently upgraded in April 2015, March-April 2016, February 2017 and March 2018), including the addition of one further deposit on the trend, being Kubuk. The mineralisation at Kun-Manie is sulphidic in character, and both Russian (Sibsvetmetniproyect) and western (SGS) studies have indicated that it can be recovered into concentrate using historically proven, simple flotation recovery methods. On 10 May 2012, Amur announced the results of flotation test work on 24 sulphide ore samples representing six grade ranges taken from the drill reserve portions of the Maly Kurumkon, Vodorazdelny and Ikenskoe deposits. The samples selected for SGS’s flotation testing were considered to be more representative of life-of-mine operating parameters and the likely variability of the ore delivered to the process plant than those originally used by SRK. Importantly, as a result of the improved recoveries, SGS was able to project markedly higher potential nickel and copper concentrate grades of 9.6% (vs 7.0% used in SRK’s 2007 PFS) and 2.9% (vs 2.4%), respectively. In August 2014, Amur updated the defined reserve at Maly Kurumkon-Flangovy, Vodorazdelny and Ikenskoe-Sobolevsky. The cumulative contained proved and probable reserve was estimated to be 39.2Mt ore containing 219,000t Ni and 58,100t Cu. The reserve was based on JORC 2012 reporting standards and a nickel price of US$8.50/lb (US$18,740/t) and was derived from SRK resource models. Taking into account all of the above developments, in 2015 Amur conceived a conceptual open-pit study based on a modified design for the development of Kun-Manie. Compared to the three pits proposed in the PFS, Amur’s conceptual open-pit study in 2015 proposed deriving production from four open pits located along the Kurumkon Trend plus two underground mines. Whereas the PFS projected a throughput rate of 4.0Mpa, this was expanded to 6.0Mtpa to produce 350,000t concentrate pa (albeit via fundamentally the same process route of crushing, grinding and floating the sulphide ore). The recovery of nickel was estimated to be 80% of the mine delivered grade of 0.57% nickel. Copper recoveries were projected to be approximately 90% with a grade of 0.15%. Significantly, for the first time, Amur’s conceptual open-pit study posited four potential development options, namely 1) a toll smelt option, 2) a low-grade matte option, 3) a high-grade matte option and 4) a refined product option. In December 2016, Amur released the results of a trade-off study between open-pit and underground mining, conducted by RPM, which identified a potential mineable reserve of 44.5Mt of ore at grades of 0.75% Ni and 0.19% Cu at Maly Kurumkon-Flangovy (MKFL) (cf a mineable reserve of 45.5Mt identified in Amur’s PEA, at an average grade of 0.53% Ni and 0.15% Cu). Key differences between the RPM study and the original PEA were a materially higher underground component of the overall mining operation and materially higher overall grades. The RPM study assumed that the nickel and copper were together recovered into an aggregate 2.5Mt of concentrate (ie a 5.6% mass-pull) containing an average of 9.9% Ni and 2.9% Cu (ie based on SGS, rather than Gipronickel, grade-recovery curves). In addition, the RPM study was conservative in that it assumed Western Australian underground mining costs. It also did not include the exploration results of the 2016 field season. On 11 January 2017, Amur announced the results of a metallurgical test programme conducted on a c half tonne sample of ore from MKFL by Gipronickel. The Gipronickel results marked the first production-scale test work from the Kun-Manie licence area and, owing to their larger size, were therefore presumed to be more reflective of the actual production process than those calculated from SGS’s bench-scale tests. In addition to issues of comparability with SGS’s result, the 0.7% Ni grade of the half tonne sample also approximated the 0.75% Ni average grade of the mineable reserve at MKFL calculated by RPM, above. Notwithstanding its larger size, recoveries from the Gipronickel half tonne sample were observed to be materially higher for all metals than the results achieved by SGS (eg 11.4 percentage points for nickel and 5.9 percentage points for copper). In part, this could be attributed to the fact that the SGS test work involved coarse pulverisation of the samples and included older material that was likely to have partially oxidised, resulting in lower recoveries. In addition, Gipronickel employed a two-stage grinding process such that, after initial grinding and concentrate generation, the reject stream was reground to allow for the recovery of a second concentrate. In order to correct the obvious anomaly whereby reserves were calculated with respect to Australian rather than Russian underground mining costs (see above), in late 2016, Amur commissioned RPM to prepare an independent review of projected operating cost estimates, which was completed in July 2017 with RPM calculating an open-pit cost per ore tonne of US$23.25 and an underground cost per ore tonne of US$24.16. These compared to a similar assessment conducted by Amur in Q115, which calculated an open-pit cost of US$20.49/t and an underground cost of US$26.37/t – albeit this was based on an assumed room and pillar mining technique, whereas RPM’s assessment assumed a long-hole open stoping (LHOS) technique. Costs were estimated to a ±25% level of accuracy and translated into an average cost of US$1.78/lb Ni in concentrate delivered to Ulak and a cut-off grade (at a nickel price of US$4.00/lb, or US$8,820/t) of 0.29–0.39% (ie less than the cut-off grade used in the mineral resource estimate in Exhibit 4). In addition, the calculated costs implied an incremental stripping ratio boundary of 3.6x between open-pit and underground mining – ie the respective operating costs of open-pit and underground mining favoured an open-pit mine at an incremental stripping ratio below 3.6x and an underground mine at an incremental stripping ratio above 3.6x. In March 2018, Amur announced its most recent resource upgrade, comprising the work conducted during the 2017 field season. Compared with February 2017, aggregate ore tonnes increased by 53.8% to 155.1Mt at a barely changed nickel grade to result in a 51.0% increase in contained nickel to 1.2Mt. On 22 February 2019, Amur announced an updated estimate for the capital cost of the access road required to link the planned mine site with the Baikal Amur Rail Line (BAM) to US$382,000 per kilometre of single lane road, including bridges, diversions and culverts, etc. The total capital cost of the 338km long road was therefore anticipated to be in the order of US$129m cf the company’s originally budgeted estimate of US$1m per kilometre (ie US$338m in total). On 26 February 2019, Amur announced the results of its updated pre-feasibility study (PFS) into its Kun-Manie project. The PFS is based on information available in June 2018 and therefore includes the mineral resource estimate depicted in Exhibit 4, but not the subsequent results of the 2018 field season. In future therefore, there may be the potential to increase the resources and reserves on which this PFS is based and thereby the life of mine of the operations. There is also potential to optimise the production schedule and thereby to move revenues forward and generate enhanced early cash flow during the first 10 years of production. The biggest opportunity in this respect is the potential to merge the pits relating to the Ikenskoe and Kubuk operations into a single ‘mega-shell’, thereby simultaneously creating economies of scale and operating synergies as well as reducing the overall strip ratio of the operation. Additional enhancements include metallurgical test work to reduce the magnesium oxide content of the concentrate on which penalty fees are levied, the potential to generate a separate copper concentrate, improved off-take terms and accessing low-cost Russian government infrastructure loans to construct the access road. Exclusive of these factors, at a long-term nickel price of US$8.00/lb (US$17,640/t), the headline results of AMC’s pre-feasibility study are shown in Exhibit 6, below. As before, more than one development option was considered (in this case both toll smelt and low-grade matte options); unlike before, no consideration was given to two further options, namely the high-grade matte and refined product options. However, these are not precluded by the decision to develop the project as either a toll smelt or a low-grade matte option and can be effectively added to the project via the expenditure of additional capital at a later stage, at least partly funded by internally generated cash flows. Source: AMC. Note: *Per annual unit of production. 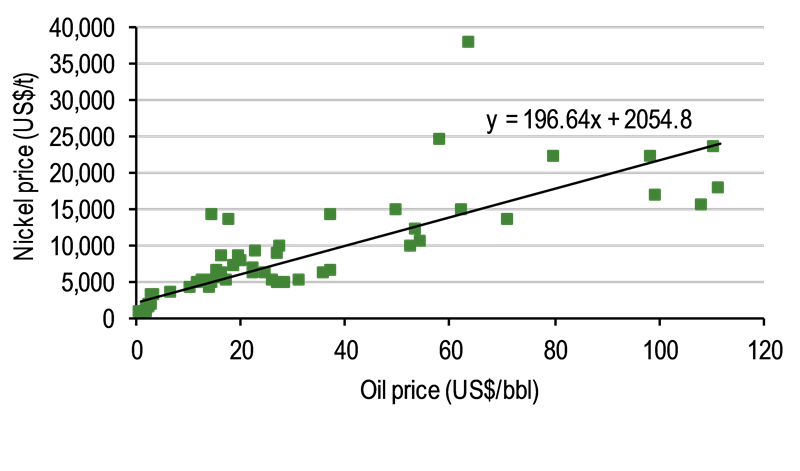 Calculated C1 cash costs for each development option fall within the second lowest cost quartile of industry reported costs, while capital intensity is well below the average of US$54,826/t and towards the middle of the modal range of US$20,000–30,000/t of 16 selected nickel sulphide projects globally. After a three-year construction period, production will be sourced from four open-pit and one underground (MKFL) mining operations to generate c 90Mt of ore over 15 years. Source: Amur Minerals, Edison Investment Research. Note: Includes losses and dilution. During the first 12 years of mine production, the overwhelming majority (ie 98.6%) of material will be derived from measured and indicated resources. All production thereafter will be derived from open-pit recoverable, higher-grade inferred resources. Concentrate will then be transported 338km on Amur’s access road from the mine site to a rail station to be constructed on the Baikal-Amur Mainline (BAM) at an average rate of 382.7kt per annum over 15 years, with the return trip being used by the concentrate haul fleet to resupply the on-site operation. In the case of the toll smelt development option, the wet concentrate would simply be loaded onto rail cars for shipment by Russian Railways to the port of Vladivostok. In the case of the low-grade matte option, where before we had assumed that a smelter would be located at Ulak, in the PFS it has been assumed that an electric furnace/flash smelter would be constructed at a station on the Baikal-Amur mainline (BAM) to produce approximately 184kt of low-grade nickel matte per annum (2.76Mt over the life of operations) – ie approximately half the tonnage of the concentrate) – at an average grade of c 18.8% nickel (ie approximately double the grade). 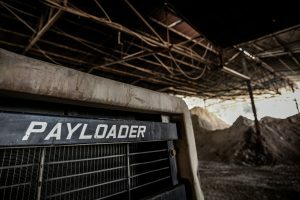 In reducing the total saleable product tonnage while doubling its contained metal content, the low-grade matte development option consequently approximately halves product transportation costs, while simultaneously attracting improved terms from off-take purchasers. Traditional demand for nickel is as an alloying element, in which form it contributes to the longevity, corrosion resistance and low maintenance of stainless steel goods. 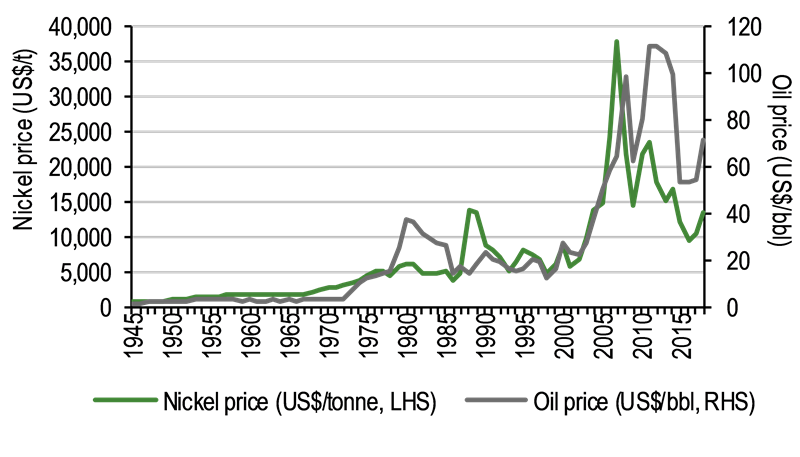 The total size of the global nickel market in 2018 is estimated to be c 2.26Mtpa and is expected to rise to c 2.45Mtpa, underpinned by annual stainless steel output growth of c 5.0% per annum. Between 2000 and 2010, global nickel supply increased at a rate of c 3.0% per annum – less than the average growth rate of consumption of 3.8% per annum for the period 2000–16. However, the rate of growth in supply increased to c 5.5% in the period 2010–16, at least partly in response to the start of nickel pig iron (NPI) production in China from 2005. Among other things, the development and expansion of NPI has been instrumental in effecting a decline in the proportion of nickel produced from sulphides (the traditional means of producing nickel) from c 55% in 2008 to c 33% in 2018. The relocation of significant NPI capacity from China to Indonesia. As a result, Indonesian nickel mine production almost trebled between 2016 and 2018. More strikingly, Indonesian NPI production, which only began in 2014, is expected to reach c 350,000t in 2020 – on a par with that of China. The construction of a new 3Mtpa stainless steel mill designed to exploit locally available nickel ores that are converted into NPI on-site. The site at Morowali is now supplied by 20 nickel ore processing facilities feeding 1.5Mt of NPI per annum into the plant. As a consequence of Indonesia’s emergence as a new, low-cost centre of production, it has become the largest exporter of stainless steel in the region and has even been the subject of an anti-dumping investigation by Chinese regulators after complaints by domestic Chinese producers. The proposal by Tsingshan (the group behind the Morowali stainless steel plant) to construct a 50ktpa high pressure acid leach (HPAL) plant at Weda Bay to convert lateritic nickel ore to NPI and then to matte before being processed into nickel hydroxide (the form of nickel favoured by battery metal producers). Since 2017, the global market for steel has also been variously unbalanced by a combination of mining restrictions in the Philippines, the prospects for new nickel mine construction in Australia, fears of a US-China trade war and fears of US sanctions being imposed on one of the world’s largest producers, Russia’s Nornickel (formerly Norilsk Nickel). As a result, Edison has decided to adopt, for the purposes of its valuation, below, a long-term nickel price of US$15,820/t (US$7.17/lb) cf a spot price at the time of writing of US$5.88/lb, or US$12,965/t and a forecast long-term price of US$7.50/lb (US$16,538/t) used in our last valuation. The largest upside risk to the nickel price concerns its use in the cathode of lithium-ion batteries. Consumption of nickel in this form is supported not only by expectations of rapid growth in the development of the electric vehicle market, but also by the increased intensity of its use as a result of efforts to improve the energy density of batteries and extend driving range. Nickel for batteries is typically consumed in the form of nickel sulphate, which is a premium grade salt that is itself typically synthesised from Class 1 nickel metal refined from sulphide deposits and produced by only a select few market practitioners. As a result, nickel production in the form of nickel pig iron or ferronickel to supply the Chinese and, increasingly, Indonesian, stainless steel industries will not be available as a source of ready supply to battery manufacturers, leading to a possible bifurcation of the market. Unlike the consumer electronics market, which typically favours high-cobalt LCO batteries, the car manufacturing industry increasingly favours nickel-rich NMC and NCA batteries, owing to their relative cheapness to manufacture. Tesla’s electric vehicles, for example, use an NCA chemistry that requires a cathode that is 80% nickel. As a result, Porsche, among others, expects the ratio of nickel to cobalt and manganese in a typical battery to rise eightfold as electric cars evolve. Estimates of the future uptake of electric vehicles vary widely, from approximately 14m in 2025 at the more conservative end of the spectrum, to c 70m at the upper end. Both represent a relatively small (c 1.1–5.5%) penetration of the total stock of vehicles of c 1.3bn globally. However, a shift of just 10% of the global car fleet to electric vehicles would create demand for 400,000t of nickel annually within a 2.26Mtpa market (currently) and research by Glencore indicates that demand for electric vehicles will require the production of an additional 1Mt of nickel per annum by 2030. Source: Amur Minerals. Note: *March 2018. Totals may not add up owing to rounding. Note that, on the basis of these estimates, for just an additional 22.7% increase in initial capital outlay and a 11.7% increase in total capital, the NPV10 of the project increases by 60.7% in upgrading the toll smelt development option to the low-grade matte one. Additional items included by AMC in its capex estimates include US$2m of closure costs, more than offset by US$5.8m in salvage value recapture and US$39.3m in initial working capital requirements, which are modelled by Edison in relation to debtor and creditor days and stock turnover for the purposes of our valuations, below. As stated previously, 2019’s PFS considered only two possible development options for Kun-Manie, namely a toll smelt option and a low-grade matte option, whereas previous scenarios also included the possibility of a high-grade matte option and a refinery plus a phased development option from toll smelt to refinery over four years with internal cash flows largely funding each incremental development phase. US$8.00/t for every percentage point above 4% in concentrate. Equity fund-raising in FY20; development in FY20–22; production in FY22. Equity fund-raising in FY18; development in FY18–20; production in FY21. 0% in years 1–5; 10% in years 6–10, 20% thereafter. Source: Edison Investment Research. Note: *See Edison’s note Amur Minerals: Cobalt-plated nickel, published on 16 April 2018. Finally, for the purposes of valuing Amur, we have assumed that the company raises sufficient equity at the currently prevailing share price so that its financial leverage ratio (debt/[debt+equity]) is no more than 80% at its maximum extent (in both cases in FY21). This would entail raising US$116.6m in equity in the case of the toll smelt development option and US$167.3m in the case of the low-grade matte development option. In our base case valuations on pages 15–16, below, we assume that these equity financings are conducted at the prevailing share price. Valuation sensitivities surrounding the assumptions behind each these funding scenarios are provided on pages 16–17, below. In valuing Amur, Edison has used two methods: one based on the typical multiples of project NPV that pre-production junior exploration companies typically trade on and the other based on the present value of the forecast stream of dividends to investors from 80:20 debt:equity financing and development of the project at the prevailing share price. In our report Gold stars and Black holes – Analysing the discount: From resource to sanction, published in January 2019, we calculated that, excluding outliers, the average value of companies with projects at PFS stage is 9.9% of attributable NPV, within a range between -15.4% and 51.3%. On the basis of Amur’s published NPVs (at US$8.00/lb Ni), this would imply a valuation for the company of US$60.8m (or 8.7c/share) based on the toll smelt option, or US$97.8m (or 14.0c/share), based on the low-grade matte option (excluding net cash/debt). However, given the strong (positive) correlation between valuations and IRRs observed in our report, coupled with both scenarios’ high IRRs, we estimate these percentages could increase to 13.0% for the toll smelt option and 15.9% for the low-grade matte option, implying valuations of US$79.9m (or 11.4c/share) and US$157.0m (or 22.5c/share), respectively. Notwithstanding these results for a project at PFS stage of development, at the BFS/DFS stage, the average enterprise value of a company typically increases from 9.9% of attributable NPV to 30.9% (within a range from -10.1% to 133.5%), which would imply a valuation for the company of US$189.9m (26.9c/share currently) based on the toll smelt option, or US$305.1m (43.3c/share currently) based on the low-grade matte option assuming that a BFS/DFS is completed as planned in 2020. We calculate that the stream of dividends that results from the proposed toll smelting development of Kun-Manie averages 2.8 US cents per share per annum (cf 3.7c/share in April 2018) and potentially reaches as high as 5.5c/share (fully diluted). When discounted at a rate of 10% pa, the net present value of this dividend stream to investors is US$0.08 per share in FY19, rising to US$0.17 in FY26, by which time we estimate that debt will have been repaid and a first dividend could theoretically be paid to shareholders. Source: Edison Investment Research. Note: *Prevailing share price in US cents. Assumes 80% financial leverage at its maximum point for both development options. Investors’ attention is drawn to the decline in the forecast amount of equity to be raised for the toll smelt option (US$116.6m vs US$138.1m), but in the increase in the amount required for the low-grade matte option (US$167.3m vs US$148.4m). Source: Edison Investment Research. Note: *Defined as (net debt/[net debt+equity]). Assumes equity funding conducted at the prevailing share price. Not only does Russia rank relatively highly in terms of Investment Attractiveness, according to the Fraser Institute’s 2018 survey, but it has also been on a broadly ascending trend since at least 2010/11. Otherwise, technical risks associated with the project include geological, engineering, metallurgical and logistical risks (including the distance of the project from ports and rail infrastructure). In terms of its development, the project is effectively at the pre-feasibility study (PFS) stage of development, compared to preliminary economic assessment (PEA) stage previously. In due course, the project will be upgraded to bankable status (either western or Russian). Among other things, investors should notice, in particular, the much greater valuation gearing of the toll smelt development option to the price of nickel than the low-grade matte development option, which may be attributed to the latter’s relatively higher margins. 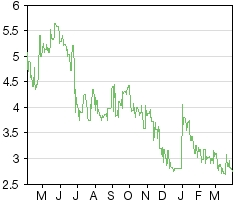 As such, it can be seen that a 10% change in the nickel price results in a c 5–7c change in valuation for the toll smelt option, but a 2–4c change for the low-grade matte option. By contrast, a 10% change in costs results in a 1–3c change in valuation for either development scenario. the variable conversion price, being 90% of the Amur’s lowest daily volume average price over the five trading days immediately preceding the relevant conversion notice. Since entering into the agreement, we estimate that Amur has converted US$2.4m of the initial US$4m advance via the issue of 59.6m shares (c 10% dilution), leaving US$1.6m (gross) of the initial advance outstanding (US$1.2m net as at 22 March 2019). On 22 March 2019, it restructured the loan to extend its maturity to March 2020 as well as drawing down an additional US$0.5m. Under the terms of the restructuring, the outstanding US$1.2m of the convertible is repayable in 12 monthly instalments at 110% of the principal portion of the repayment and its accrued interest (to the extent not having been converted into new ordinary shares), with the first repayment in respect of the initial advance becoming due on 20 April 2019. The further advance of US$0.5m (net of an implementation fee, which will also be drawn down and immediately paid to the investors) is repayable in 12 monthly instalments, also at 110% of the principal portion of the repayment and its accrued interest (to the extent not having been converted into new ordinary shares), with the first repayment in respect of the further advance becoming due on 20 April 2019. In return for the amended terms, the company is issuing the investors with 10,902,956 warrants with an exercise price of 3.76p. Otherwise, Amur had US$1.0m of net cash as at 30 June 2018 after US$2.5m of cash outflows (before financing) over the course of the first six months of the year. We estimate a further US$2.1m of cash outflows in H218, resulting in US$1.1m of net debt as at 31 December 2018, which would have been funded by the amount of the group’s convertible outstanding. Note that, for the purposes of our valuations, above, and our financial summary, below, the balance of the convertible is treated as conventional debt (owing to the difficulty/impossibility of forecasting a likely conversion price for the convertible stock). Mr Young is a geological engineer who has worked extensively in the CIS since 1991. He has 40 years’ experience in the mineral resources industry, including responsibility for large projects in remote areas, as well as the junior sector. He has a BSc in geological engineering and is a licensed professional geologist. He has been CEO of the company since October 2004. Mr Schafer has 41 years’ experience in the mineral industry with both major and junior mining companies, including notable experience in Russia’s Far East. He is currently executive VP, business development at Hunter Dickinson. In addition, he is president of the Canadian Institute of Mining & Metallurgy, VP of PDAC and a past president of the Mining & Metallurgical Society of America. Mr Naumovski has more than three decades of experience in Russia, most recently as VP and general director of the Moscow office for Kinross. He has also served as senior VP and general manager of Visa International in the CEMEA region, as senior banker and head of mission for the Russian team of the EBRD in Moscow and as commercial secretary for the Canadian Embassy in Moscow and later deputy director for USSR and Eastern Europe for the Canadian Department of External Affairs and International Trade. Mr Gazzard joined the board after being an external advisor to Amur for many years and with over 10 years’ experience as a fund manager in London. Between 2002 and 2010, he participated in the listing of three Australian technology companies on AIM, operating at the senior executive level before taking a position as COO of Litebulb Group overseeing multiple funding rounds and acquisitions over two years. Since then, Paul has worked as a corporate finance consultant as well as an adviser to a number of high net worth individuals on specific corporate and management-related issues. This report has been commissioned by Amur Minerals and prepared and issued by Edison, in consideration of a fee payable by Amur Minerals. Edison Investment Research standard fees are £49,500 pa for the production and broad dissemination of a detailed note (Outlook) following by regular (typically quarterly) update notes. Fees are paid upfront in cash without recourse. Edison may seek additional fees for the provision of roadshows and related IR services for the client but does not get remunerated for any investment banking services. We never take payment in stock, options or warrants for any of our services.